Preserving the memory of the history of salvation: When you “turn away” your heart, you risk having a “heart without a compass”. That was the message of Pope Francis at the morning Mass at the Casa Santa Marta. When your heart is turned away, when you take the road that is not right – either going the wrong way or taking a different road, but not going along the right road – you lose your sense of direction, you lose your compass, with which you should go forward. And a heart without a compass is a public danger: it’s a danger for the person himself, and for others. And a heart takes this wrong path when it does not listen, when it allows itself to go astray, carried away by [other] gods, when it becomes an idolater. Often, though, we are not capable of listening, the Pope said. 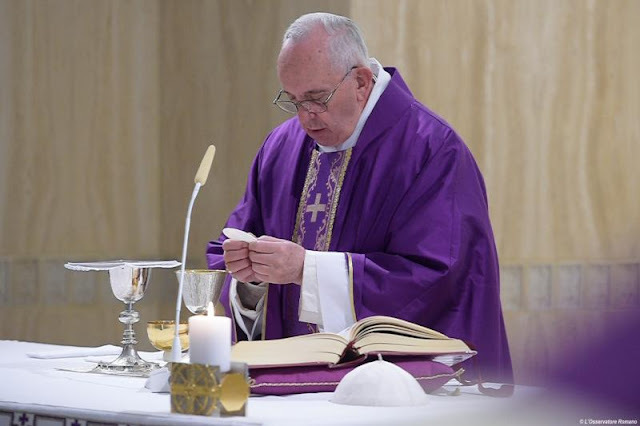 Many people are “deaf in the soul” – and “we, too, at various times become deaf in the soul, we do not hear the Lord.” Pope Francis warned against the “fireworks” that call us back, “the false gods” that call us to idolatry. This is the danger we face along the path “towards the land that was promised to us: the land of the encounter with the risen Christ”. Lent “helps us to go along this path”, the Pope said. Well-being, even spiritual well-being, has this danger: the danger of a certain amnesia, a lack of memory. I feel good like that, and I forget what the Lord has done in my life, all the graces He has given us, and I believe that it is my own merit, and I go on like that. And then the heart begins to turn away, because it doesn’t listen to the voice of the heart itself: memory. The grace of memory. Pope Francis recalls a similar passage, from the Letter to the Hebrews, which exhorts us to remember “the former days”. “Losing memory is very common”, the Pope said; “even the people of Israel lost their memory”. This kind of memory loss is selective, he explained: “I remember what is convenient to me now, and I don’t remember something that threatens me”. For example, the Israelites in the desert remembered that God had saved them; they “could not forget Him”. But they began to complain about the lack of water and meat, and “to think about the things they’d had in Egypt”. The Pope notes that this is a selective memory, because they forgot that the good things they had in Egypt were eaten at “the table of slavery”. In order to go forward, we must remember, we must not “lose history: the history of salvation, the history of my life, the history of Jesus with me”. The Pope said we must not stop, we must not turn back, we must not let ourselves be carried away by idols”. Idolatry is an attitude of the heart, when you prefer to do something because it is more comfortable for me, instead of the Lord – precisely because we have forgotten the Lord. At the beginning of Lent, it would be good for all of us to ask for the grace to preserve memory, to preserve the memory of everything the Lord has done in my life: how he loved me so much, how he loved me. And from that memory, to go forward. And it would also do us good continually to repeat the advice of Paul to Timothy, his beloved disciple: “Remember Jesus Christ, risen from the dead”. I repeat: “Remember Jesus Christ, risen from the dead”. Remember Jesus, Jesus who has accompanied me up to now, and will accompany me until the moment when I must appear before Him in glory. May the Lord give us the grace to preserve memory”.